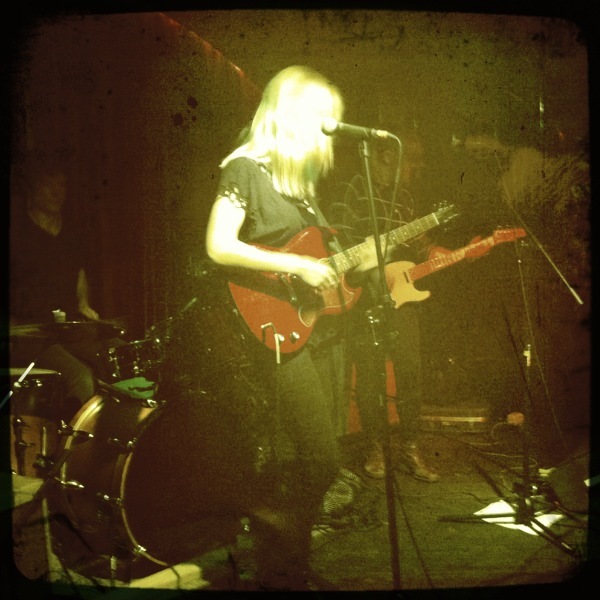 We fell in love on October 15th at Kung Fu Necktie with a band called BLEACHED. It was one of those love at first sight sound kind of things. Their music felt like home and something seemed so familiar. While we didn’t know it at the time, perhaps lack of due diligence, we had heard the lead singer and guitarist before. As it turned out, Jennifer Clavin lead singer and guitarist was in bands with whom we were familiar and enjoyed greatly: Cold Cave and Mika Miko. Back for a new adventure, her and her sister Jessica Clavin (also of Mika Miko) formed BLEACHED, started writing material (in 2009) and much later (due to Jennifer’s involvement with Cold Cave) touring with a supporting cast (drummer and bassist) of two: Scott and Kevin. But back to the love thing – we aren’t sure that this was caused by their past incarnations but rather the sound they are currently producing. In fact, we are certain it is their current sound. BLEACHED has that fuzzed out beach garage rock punk sound we adore. It’s part Best Coast/Joan Jett/Ramones/Soft Pack/The Damned/et al. How lucky to have heard them in Philly. The crowd loved them too and the set performed was fantastic – perhaps a warm-up to CMJ and Jessica’s homecoming after leaving NYC post Cold Cave stint. We mean warm-up in the most possitive way possible though as their set was on point and enveloping making it difficult to shoot video and take mental notes about the on-goings. Philadelphia’s Psychic Teens play a raw brand of post punk/psych metal and on this September 27th, they did it with a light display! A rare treat for a show at KFN. Loud and in charge, Joe, Dave, and Larry threw down on each track with unadulterated sound. Haunting guitar chords and vocals perforated the venue while heavy drums carried on the beat. Listening to PT we drew comparisons to Interpol (vocals), Bauhaus (feel of musical composition) and <insert your choice electric guitar-laden punk bank here>. In the end, nothing compares to hearing these guys live as seeing them is truly a visceral experience. Be sure to check their new album out now, Teen, on Halloween. Even though we have a backlog of 13 performances to share with you, we felt that a review of some of the Popped Festival performances and festival concert ongoings would be a more timely choice. Promising to be a formidable event, we looked forward to it with great anticipation. An outdoor show at FDR park set to the backdrop of the lakes, pretty stone structures and old trees sounded like an amazing oasis from the norm. Add to this food trucks, multiple stages of performers, comedy and the excitement ballooned. Sadly, as all balloons eventually do, this one deflated. Even sadder, it did so before the concert even took place. Reluctantly, we missed some of the first bands to avoid being trapped inside the dome all day. It was a shame because had the concert been outside, the approach taken would have been completely different. This is probably the case for many and so lots did not see bands they might otherwise would have. Just another indication the festival experience had been crushed and that this was just a long all-day concert instead. Inside the venue, it was definitely a raucous atmosphere. Smoke hovered in the hallways which was particularly amusing. A basketball gym rarely sees such things. Vendors and sponsors hawked merchandise and SWAG to people as they moved throughout the crowded corridors. A two-by-two system was initiated for those wanting to smoke or enter the floor through the center staircase. Kids, new to drinking and perhaps concerts themselves, gallivanted around. Aided by the fact that the one beer policy was not being enforced (a fact which we relished) we were able to numb ourselves to the dismantlement a bit. Other people who were more experienced which such events co-mingled and the crowd grew as the night went on. It apexed around the time of Girl Talk’s set culminating in a vibrant sea of humanity dancing to Gregg Gillis’s catchy mash-ups. All in all, it was an interesting experience. Rakim played a set which was classic but mired by inept sound techs and a semi-unappreciative and ignorant audience. Cults set was fantastic yet few had yet to arrive. Foster the People were everything for which we had hoped. Titus Andronicus was very energetic and dynamic. Girl Talk brought down the house and Pretty Lights lit the rubble ablaze. Never-the-less. for us, the show being materially altered from what was initially billed was a let down and created an experience that, honestly, would have been avoided if this was what was intended. It was still nice to see what we saw and experience the same. Given the alternatives, there was not much that could be done and live music is why we are here. Check out some videos from our experience and perhaps catch some video that you missed! ** A few other videos from Foster the People and Rakim from this show can be found on our YouTube channel. AFICIONADO play the things you like lead single off their new album live @ JB’s in Philly on 082511. It’s really easy to play it safe and jump on board the latest trend, imitating the exact style and sound of everyone’s favorite band of the week. It’s really easy to play into the hands of a specific demographic, knowing without a doubt in your mind that kids will eat up every hook and pile on for every sing-a-long. But how many times can we walk down the same old roads? At some point, we need to break from this monotony and make our own roads. We need to create something for ourselves that is more than just a quick, cheap, and easy sell. Something that has many layers to dissect, discover, and enjoy. This is what Aficionado has set out to do. Drawing influence from an array of bands ranging from At the Drive-In, to Cursive, to the Hold Steady, Aficionado has a developed a unique style they are happy to call their own. With roots in punk music, the band mixes organ, flute, and occasional horn arrangements into it’s unorthodox blend of post-punk.